He's one of the most influential figures in the music business today and has also made a serious name for himself in the fashion world as the head of labels like Phat Farm and American Classics. 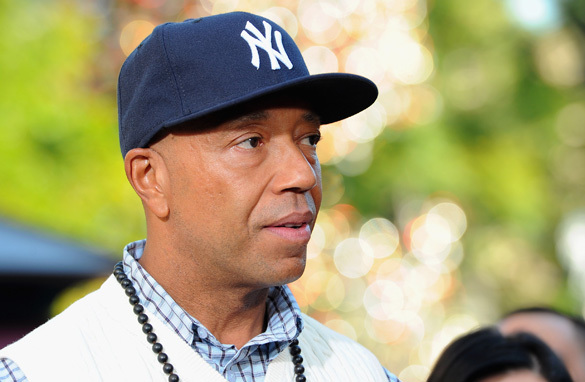 Born in 1957, Russell Simmons co-founded hip hop label Def Jam with Rick Rubin and today the company is one of the most powerful record companies in the business. However, if hip hop music isn't your thing, chances are you still recognize his name. Simmons was married to model Kimora Lee and in 2007, the pair starred in a reality television show called "Kimora Lee Simmons: Life in the Fab Lane." Simmons is currently ranked as the third richest personality in the hip hop world with a wealth estimated to be more than $300 million. Today, Simmons is out with a new book called "Super Rich: A Guide to Having it All." Here's your chance to quiz this important figure in the music and fashion world. I'd like to know if Phat Farm and American Classics would be interested in top notch art photography for any of their textile- graphics clothing lines. I am an art photographer looking to market my photography in the textile/graphics area and think it would interest your fans and audience. If you are interested in a sample that may interest you further please contact me at one of the above sites. Since your divorce from Kimora have you now moved on, both in your personal life and in your buisness, and are you still involved in Phat Farm as it seems Ms Kimora is running the whole show? please give me a head start of a million dollars, then i can be one of the wealthiest people on earth. Do you plan to open any flagship stores for Phart Farm and American Classics in Africa, particularly in Nigeria in the near future? Did you always have faith that you will suceed in your ventures? Or were there moments of doubt? If there were moments of doubt, how did you come back? How do you see the future of mobile technology and Hip-Hop? A number of artists like Dr. Dre and Luda have ventured into the high-tech market with their lines of headphones. Will we see a Rush handset anytime soon? I know you are vegan, but do you adhere to that philosophy into your personal style/clothing that you wear? Do you wear leather, silk, wool and down? If so, why not? Also, why not create a true vegan line since you are so adamant about it for your food/lifestyle? Can you name the two founders of the very early Harlem NY hip-hop / disco record label P&P? I am a huge fan of your brands. Do you have any plans to venture into the Canadian market on a retail storefront basis? We would love to have you! What kind of advice would you give to young entrepaneurs that would like to start their own business in the music industry? What's does it feel like to be recognized for your talents and have the ability to persue your dreams? Even though you've probably exceeded some of your dreams, I'm sure you still have many more. I feel I have many talents but sometimes feel caged in by my responsibilites and threfore feel unable to drop everything to persue my dreams. You must feel an immense sense of freedom. What's that like? How hard is the profitability of music targeted towards mainly the younger generations (such as Hip-Hop) affected by file sharing devices? Do you consider downloading music (in such unofficial ways) as unethical as it jeopardizes the artist's effort, or is it beneficial as his/her work gets passed to more people? Can it be stopped in any effective ways? Lastly, how do you see the mainstream music developpin in the next five years? –	How is Russell Simmons’ book called "Super Rich: A Guide to Having it All" going to Improve the Well-being of ALL people, who were struck by the Economic Crisis? I am awaiting Russell Simmons’ replies. I am currently studying to become a better producer as well as an audio engineer. However my story is a little bit different. I was born in Honduras and was raised in Nicaragua my entire life. I've witnessed extreme poverty and even struggled a little bit. Having dealt with that I saw that the musical influence of Hip Hop and Latin music really flowed nicely together. So my question would be how do you see Hip Hop branching off into the realms of latin culture? How do you feel hip hop today is influencing third world countries? What advice or what guidance could you provide an international student of the game of hip hop to succeed in this industry? Your best rap album & fav hip hop artist? I know that you are involved with a variety of social issues. And during your visit to South Africa you met people like Johan Rupert and including a visit to Mozambique where uoui met Mr Mandela and his wife Graca. Are you considering in gettign involved in social issues and helping specific foundations in Africa? my friends dad is a very rich fellow.i work as a personal assistant to my friend.his dad is c.e.o to one of the big transport company in nigeria.please any advise to me or him(my friend)on how to be super rich in this jetage. What messages do you see generated in todays music? Do you feel it is time for artist that do not sound like everybody to break free? It appears as though most singers sound the same with little uniqueness is voice and style. Do you support non profit organizations and encourage those who have to give back to the community and help those who have not? What would happen if people with money would hold a million lotto for the best ideas to save our planet, another one for how to unitfy our community and stop the violence.....and so on and so forth since it appears many only are motivated by money? Do you feel we as American's have gotten lazy and are unaware of what is going on around the world and how it effects us? What do you feel will become of live music with full band? Mr. Simmons, Whats is it like to be rich? I went to Global Grind to see if you had any openings, but your maximum age is 35 and all other postings are internships. There are a lot of people in their 40's that bought into Hip Hop culture and now there is no opportunity to expand into it. I'm feeling a little hate here. The 35+ generation has a plethora of experience and can offer insight into new vertical markets. It's about collaboration of the mind as we draw from our experience. I am a young entrepreneur myself in Ghana,you really inspires and have tried to get work book but they are not available here,i have come with this event to host you in Africa,Ghana and Nigeria to be precise for a book tour,this an event to meet and interact with the youth,sign book etc,kindly link me up with your team to have a detailed discussion with them about this event. Ending here,hoping to hear from you or your team ASAP,counting on your cooperation.